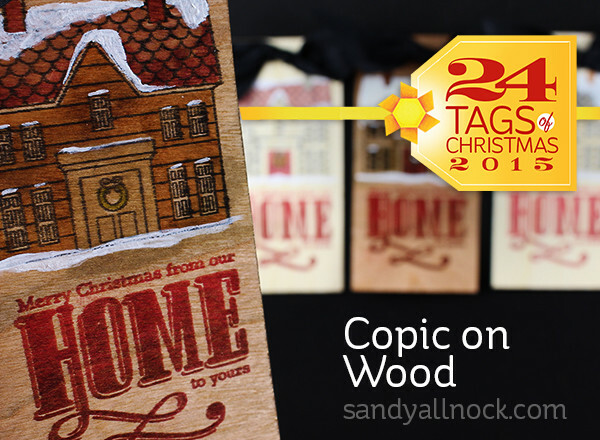 Welcome to the 24 tags of Christmas series for 2015! It’s Day Two with another four tags – check out yesterday’s watercoloring! If you’d like to see last year’s day two tag, click HERE. I’ve been wanting to play with this wood paper for quite some time – and I was delighted to see that my Copic markers worked on it! I’ll be experimenting with more elaborate images in the future. Check out the video below, or click HERE to see it in HD on YouTube! These tags would be so perfect to attach to a plate of Christmas cookies and deliver to neighbors. What? You don’t know your neighbors? Well last holiday season I decided to change that in my own life…I baked cookies and made plates of them, then attached handmade tags. Delivered to stunned neighbors! One even invited me in for a cup of cider. Give it a go and see if you can break the ice with people living down the street! I’ve used wood paper before to make a guitar, but never thought of stamping and coloring on it! St Jude Children’s Hospital. Beautiful tag Sandy. What a unique idea to color on wood paper. I want to get some now and try out a project. Thank you for sharing. My favorite charity is the National Down Syndrome Society. Love the Copics on wood! Make A Wish Foundation is the charity I’d pick! Wow these tags are so neat I love the look and feel of them. I did not even know they created tags out of wood paper. I really love all your videos Sandy I am an avid watcher. My Charity is Angels Among Us Pet Rescue. Another of my favorite charities is Union Gospel Mission. I’ve never seen wood paper before! Love your project! I love the wood!! The National MS society… Capital chapter. What a cool idea to make tags out of wood paper! My charity is the Preemptive Love Coalition. How delightful these are! I never would have expected wood as an option! Favorite charity is St Jude’s Children’s Hopspital. Really cute and rustic looking. These are so cute! Thanks for the inspiration. My charity of choice is St Jude Children’s Research Hospital. K9’s Warriors is the Charity. Love wood! Thanks for another great idea! How fun are these?! 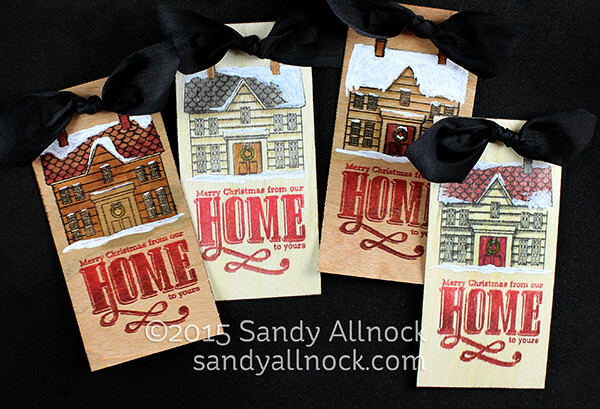 I love the wood grain tags and the dark wood is my favorite for these tags. My favorite charity is one to do with Military Families or Breast Cancer Research. Thank you for sharing this new fun idea. I have used the wood paper for die cuts, but not colored on it. Will definitely be trying that in the near future. My charity of choice is Homeless in Seattle. Another great tag and video! I have not seen this particular wood paper. I just ordered some; looking forward to seeing what all I can do with it. Ellen Hutson’s description says you can also foil on it. If I win the luck of the draw, my charity would be either The Truth 365 (or its primary sponsor, “Arms Wide Open Childhood Cancer Foundation.”) Both are registered 501(c)(3) public charities, and 100% goes to childhood cancer research. This is such a cute stamp! Great idea for giving away Christmas goodies! My favorite charity is Heifer International. The wood paper makes the house look like a log house, and there’s nothing like Christmas in a log house. My charity is anysoldier.com. Who would have thought to use wood paper for tags? You of course! Love these! So adorable! And the Copic white looks like snow! My charity is Lupus Foundation of America, Mid-South Chapter. These are amazing done on wood! I love the look of the snow on the rooftops! My charity would be the American Diabetes Association. Wow! These are stunning on wood! I never would have dared to try something like this on wood. You’re so creative and clever!! Love thes tags! They remind me of the gingerbread houses I make with my grandkids! My charity would be the ASPCA. Thanks. What a great idea! This set is beautiful and your colouring is very heful! Any orphanage is a great place to help out! Love these wood tags. The wood gives the feeling of warmth and security, just right for Christmas. My charity is Randolph SPCA. What’s that favorite saying of scardy-cat papercrafters? Don’t worry about mistakes, it’s only paper. Now we’re going to have to change it to Don’t worry about mistakes, it’s only a piece of wood!! Cute tags, and useful for so many occasions. I am going to steal someone elses favorite charity, and say that K9s for Warriors is a wonderful program for service dogs to help our veterans. Especially appropriate as today is Veterans Day here in the USA. Would never have thought to use wood for tags. My favorite charity is transverse myelitis. I love how you made each house look different. My favorite charity is the Leukemia & Lymphoma Society which is close to my heart since I was dig nosed with non-Hodgkin’s Follicular Lymphoma in 2011. One of my favorite charities is Mobile Loaves and Fishes. Love the dimension these tags have on wood! They are comfy cozy beautiful! These are neat! Kind of look like little log cabins! I support the Mid-Ohio Food Bank! Love the texture of the wood. Gorgeous! Fabulous tags! Love the look of wood. My favorite charity is United Methodist Committee on Relief. They serve people across the globe with disaster response, health, food security, etc….and 100% of the donations go directly to projects. Love the idea of using the wood for those tags. The home stamp on wood – somehow is all the perfect touch! Glad to know I can use Copics on the wood I’ve been hoarding. Fun tags! Beautiful tags. I am going to have to try stamping on the wood paper that I have. Thank you for sharing your talents. I love what you do, I hope one day to be as great. My charity is actually more personal, close to home. It is however greatly important. Loved the video using wood paper. I need to try that! My favorite charity right now is Wounded Warrior Project. The name alone speaks volumes. Love the final touch of snow on the tags. Thanks for the chance to win. And my charity would be Special Olympics. Beautiful tags, thanks so much. I think my new favorite charity is the brain aneurysm foundation, having just lost my brother and am at risk myself. You always have such great ideas although most of them send me shopping, again. My charity is Wounded Warriors. I’m hoping to make some of my own tags this year. Thanks for the inspiration…yours are beautiful! And because it’s that time of the year, I’m going to name my charity as Samaritans Purse/Operation Christmas Child. so many great charities out there that I give to, Heifer.org is one that I like.